After much deliberation, here are my favorite ten polishes that I tried in the past year. Some new to me brands, some tested and true and lots of shimmer and sparkle! Great Lakes Lacquer The Jewel Of Ontario was one of the Indie Expo Canada limited edition shades, and one of my first from the brand. You know I love my teals, and this is no exception. See the full review here. China Glaze Dashboard Dreamer is such a lovely delicate shade. The soft shimmer adds some contrast without being overwhelming. See the full review here. Girly Bits Cosmetics Grand Prospect Haul was the exclusive shade for Polish Con NYC. Words will never be enough to describe this polish so you can just look at the picture to understand why it was a favorite this year. See the full review here. CANVAS Lacquer is another brand that I got to try for this first time this year. I picked up this shade at Indie Expo Canada and am so glad I did. Despite a good dose of flakes and scatter holo shimmer, this shade still retains a delicate feel that I love. See the full review here. Interesting neutrals have always had a place in my heart and Femme Fatale Cosmetics Cracked Cosmos is the perfect example. From far away it looks like a soft taupe. Up close those opalescent flakies take over. See the full review here. Emily de Molly The Heart Of The Ship is one of those thermals where all the states complement each other perfectly. The excellent formula was a bonus. See the full review here. Girly Bits Cosmetics Slay Ghoul Slay is another one of those interesting neutrals that won my heart. The colour palette sticks to a soft taupey grey but the holo shimmer and flakes kick it up a notch. See the full review here. Tonic Polish Alchemy is the perfect balance of shift and holo. See the full review here. 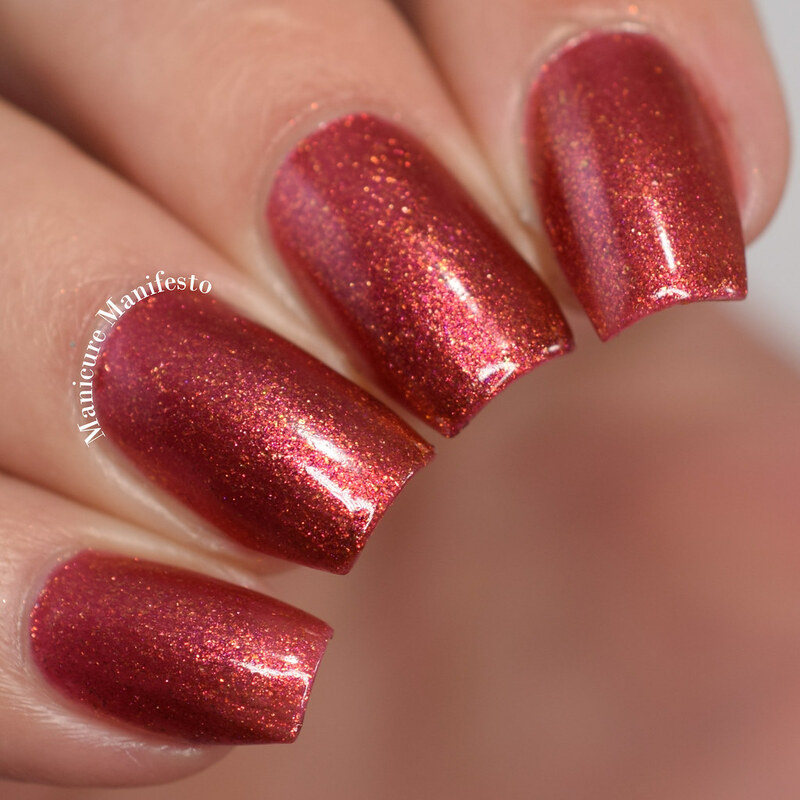 Zoya Tawny is part of the Party Girls collection and was a surprise favorite since I don't always go for oranges and I didn't love this in the bottle. On the nail though the combination of squishy jelly base and flecked shimmer was perfect. See the full review here. Last but not least, a recent favorite. Emily de Molly Swimming In Circles was part of the December release and instantly caught my eye. It is so bright, so shiny and had an excellent formula. I see this going on my toes for my next warm place vacation. See the full review here. All gorgeous choices. Thanks for the Girly Bits love. Now I have some more polish to be on the look out for!